Mathews was conceived in Texas and moved to California with his family when he was six years of age. He worked exceptionally hard as a kid to realize his dream of becoming a MLB player. Many of his childhood days were spent on the baseball field of Santa Barbara High School in California. As a result, he took long strides toward his goal and upon having achieved it, apart from becoming one of the greatest baseball players the world had ever seen, the same baseball field was renamed in his honor. In 1976, Mathews was inducted into the Hall of Fame of Wisconsin Athletic. Two years later, he was inducted into the Hall of Fame of National Baseball. He is currently placed second on the list of all-time third basemen when it comes to RBIs, total bases, home runs, and slugging percentage. According to the list of the 100 greatest baseball players of all times, the Sporting News placed Mathews on rank 63 in 1999. 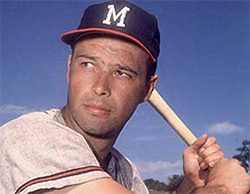 During the same year, Mathews received a final nomination for the MLB Team of the Century. 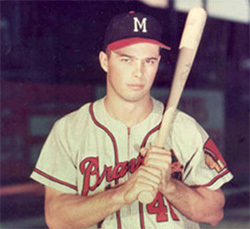 In honor of his contributions to the Milwaukee Club, the Braves retired in number 41 jersey. Mathews passed away in 2001 due to pneumonia-related complications. Later that year, his memory was honored by the Braves as patches that bore his jersey number were placed on the players' jerseys. Not only was Eddie Mathews a powerful hitter and a crucial part of his teams as a player, but he also tried his luck at management when he was at the Braves' helm between 1972 and 1974. Mathews is among very few players who have played, coached, as well as managed the same team. He was on the touchline when the legendary Hank Aaron scored his record-breaking 715th homer. 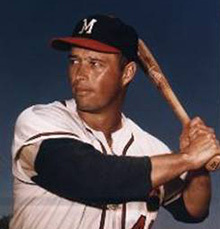 During his career, Mathews represented only three MLB teams – the Atlanta Braves between 1952 and 1966, the Houston Astros in 1967, and the Detroit Tigers between 1967 and 1968. His career highlights include selection into the All Star team on 12 different occasions. When he was voted into the Baseball Hall of Fame in 1978, almost 80 per cent of the votes were in his favor, showing just how great a player and entertainer he was during his prime.